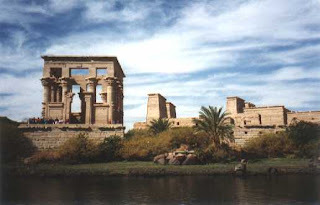 Of all the ancient temples, the sacred temple island of Philae is said to be the most beautiful. As it is on an island it is reached by boat. From the level of a small boat it captivatingly rises up from the calm deep waters of the Nile like a mirage. Its serene aura reaches you even before you set foot on its stone floor. The placid ambiance may not only be due to its scenic location but more to, the secrets the pillars and walls have witnessed over time. They seem to be willing to share stories and events but only at their leisurely calm pace. 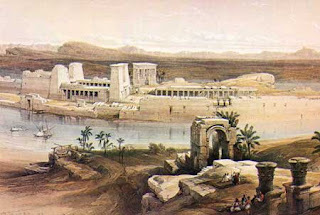 The Temple of Philae or "The Jewel of the Nile" in ancient days was the center of the worship of Isis, and the last outpost of the nearly 4000 year old ancient Egyptian religion. It was told that Isis managed to trick the all powerful sun god Ra into telling her his secret name (the name that held all his divine power). By creating a magical serpent that bit Ra. She was called upon to cure him but to do so she had to know his secret name, which he finally divulged giving her power equal to his own and so she became divine and as powerful as Ra himself. The end to this religion came in 535 A.D. when the Roman emperor Flavius Anicius Justinianus ordered the closure of the temple, forbad the art of reading and writing hieroglyphs and imprisoned its priests. This put an end to the religion that had spread beyond the lands of Egypt and spread all across the Mediterranean. Isis was the sister-wife of Osiris and the mother of the god Horus. Osiris was a great and just king who was loved by his people and wife, but he was hated by his brother Seth (the god of the underworld). Seth was jealous of his brother so he devised a plan to get rid of him. He secretly obtained Osiris' measurements and had a magnificent casket of the rarest wood and decorated with ebony, ivory, silver and gold made to fit him exactly. 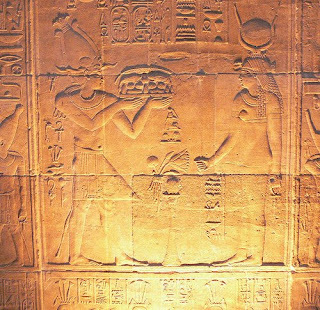 He then held a great feast in honor of Osiris where he offered to give the casket to whoever fit it exactly. 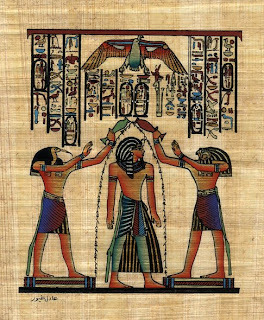 With the aid of 72 of his wicked friends they tricked Osiris into trying it for size, but as soon as he lay in it they nailed the lid shut and threw the casket into the Nile. On hearing of this Isis was devastated and set out to look for him throughout Egypt. Isis learnt from the children who played near the riverside the direction of the floating casket. She followed it until she learnt that the chest had come to rest near a tree near the city of Byblos (modern day Lebanon) and because of Osiris' presence the tree shot out branches and grew leaves and flowers, and soon became a famous tree. The king of Byblos cut the tree down and fashioned it into a pillar for his palace. Isis told the queen of Byblos of her plight and was allowed to take the casket out of the pillar. She returned to Egypt and hid the chest in the marshes of the delta. And when no one was looking she opened the chest and turned into a bird called the kite and flapped her mighty wings. The wind created by her wings gave Osiris the Breath of Life for one day, during which she conceived her son Horus from him. Seth managed to find the casket again and after opening it he rented the body into 14 pieces and scattered them along the shores of the Nile for the crocodiles to eat. Isis seeking the help of her sister Nephthys and Anubus the son of Nephthys, who was said to take the form of a jackal to find all the pieces of Osiris. All the pieces were recovered except for one. She stuck the pieces together and wrapped him in linen making him the first Egyptian mummy. Not able to return in a human form, Osiris was sent to rule the underworld, being the only person to live after death. Isis then returned to raise her son Horus, who often took the form of a hawk. Horus eventually avenges the death of his father and manages to defeat Seth. Horus was then given the privilege of taking his father's place and ruling Earth as Osiris had once done.